This stunning cheese board and cutting utensils kit is the perfect blend of sophistication, functionality, and charm. This entire serving tray set adds the perfect rustic, quaint feel to any room and occasion. Derived from 100% premium acacia wood it is a hard wood, providing durable strength. Rich in natural oils, these cheese serving trays for parties can hold up to a lot of wear-and-tear and are cut, corrosion, and water resistant. Acacia is considered an optimal material for cheese boards because it doesn’t jeopardize the sharpness of knives and naturally contains antimicrobial properties. The acacia material creates rich, beautiful layers of wood that stands out at any dinner party, patio party, or food display table. The cheese utensils, crafted from 420J2 stainless steel with wood handles, retain their sharpness and aesthetics when properly cared for. Our cutlery is great for all textures and types of cheese. They also double as efficient cheese spreading and serving tools and the pronged knife can slice through breads with ease. 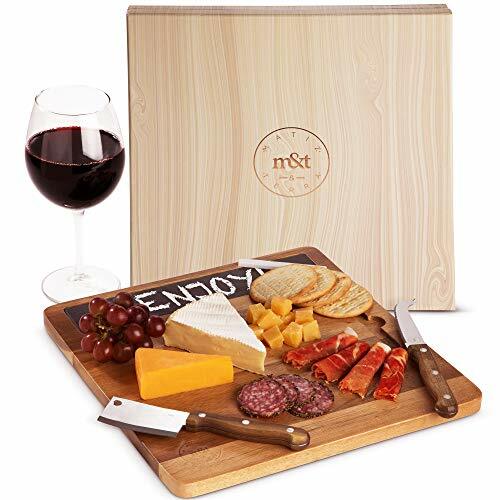 This entire meat, bread, and cheese display comes with a cheese board, a cheese cleaver, a pronged knife, a chalkboard slate, 2 pencils, and an adorable gift box, making it the perfect addition to any kitchen, dinner party, or cocktail hour. ✔ QUALITY YOU CAN TRUST: Our cheese server is 100% acacia wood with rubber feet. The cutting and serving utensils are corrosion-resistant stainless steel with a mirrored finish and wooden handles. Together, this gourmet appetizer serving set is unmatched in durability and craftsmanship. Acacia wood doesn't influence the blades, so the cutlery remains sharper, longer. Its strength, density, and impeccable build will provide long-lasting, scratch-free assistance for years to come. ✔ WHY ACACIA? With bamboo being popular for kitchenware, many people wonder why we opted to utilize the acacia tree. We chose acacia wood for its numerous, superior qualities. It is a harder, denser wood that is rich with natural oils, providing a textured appearance and water-resistant antimicrobial properties. Acacia is eco-friendly as it's not an endangered species. Free from harmful chemicals, glues, plastics, our organic product is safe and optimal for cutting and serving food. ✔ ELEGANT SERVING TRAY WITH A LITTLE EXTRA: At Matiz&Terra, we pride ourselves on beautiful kitchenware that is equally unique in design and function. Our cheese plate set isn't your typical charcuterie platter. It comes with a cheese cleaver and pronged knife cutlery set along with a chalkboard slate and pencils so you can write greetings, identify different foods, or inscribe sweet little quotes. This complete charcuterie platter is all you need to accessorize a party and impress your friends. If you have any questions about this product by Matiz & Terra, contact us by completing and submitting the form below. If you are looking for a specif part number, please include it with your message.